I have a container that is running the Apache service in the foreground. I would like to be able to access the container from another shell in order to "poke around" inside it and examine the files. At the moment, if I attach to the container, I am left looking at the Apache daemon and cannot run any commands. Is it possible to attach another tty to a running container? 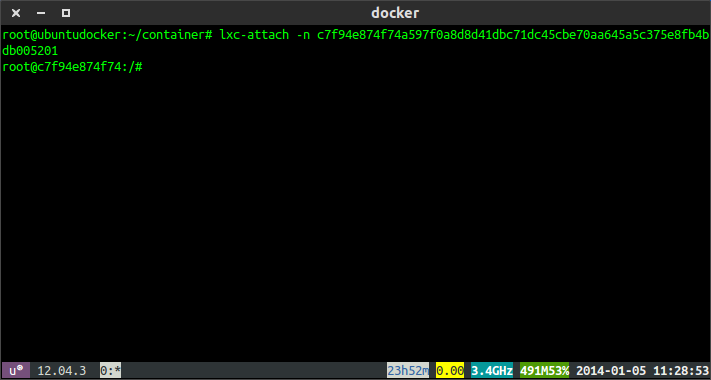 Possibly, I can take advantage of the fact that Docker is actually just wrapping around LXC containers? I have tried sudo lxc-console -n [container-id] -t [1-4] but it appears that only one tty is made available and that is the one running the apache daemon. Perhaps there is a way to enable multiple lxc consoles during the build? I would rather not configure and build the container with an openssh service if possible. 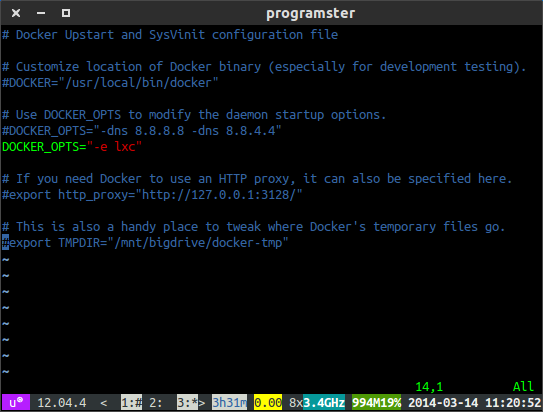 Then use the command docker-enter <container-id> to enter the container. As of docker 0.9, for the steps below to now work, one now has to update the /etc/default/docker file with the '-e lxc' to the docker daemon startup option before restarting the daemon (I did this by rebooting the host). 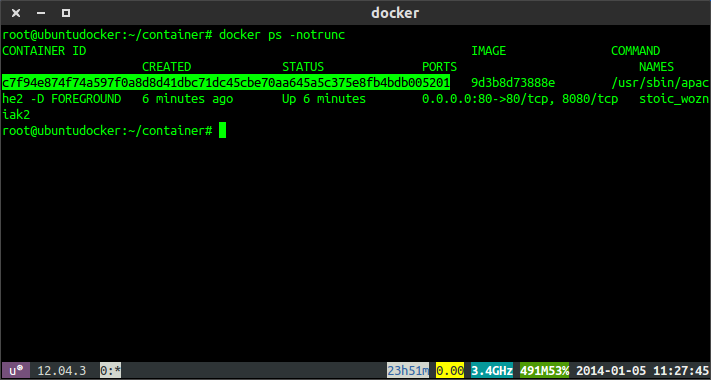 ...you can use docker ps -notrunc to get the full lxc container ID and then use lxc-attach -n <container_id> run bash in that container as root. Update: You will soon need to use ps --no-trunc instead of ps -notrunc which is being deprecated. Enter the lxc attach command. 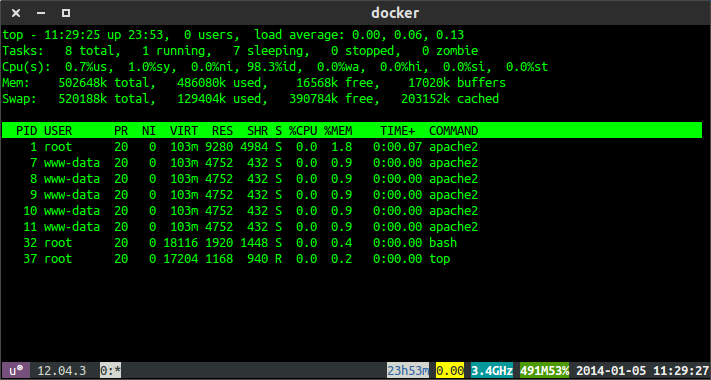 Top shows my apache process running that docker started. nsenter does that. However I also needed to enter a container in a simple way and nsenter didn't suffice for my needs. It was buggy in some occasions (black screen plus -wd flag not working). Furthermore I wanted to login as a specific user and in a specific directory. 1170fe9e9460 is the container id in this case. Will take you to the containers console. Not the answer you're looking for? Browse other questions tagged docker tty or ask your own question. Start full container in Docker? Docker exec versus nsenter: Any gotchas? How to run many commands in docker run and stay interactive?